(Newser) – Snake hunters trying to rid the Florida Everglades of invasive Burmese pythons used a new method to make a record-breaking catch. 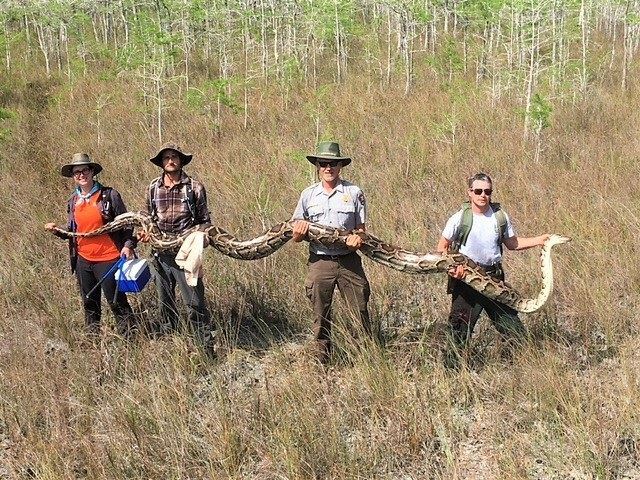 A team at Big Cypress National Preserve caught a 17-foot 140-pound female python, the longest python ever caught in the Everglades, the Guardian reports. The snake contained 73 "developing eggs," the team said in a Facebook post. The team said they caught the snake by tracking a "boyfriend" male snake that had been fitted with a radio transmitter. The program has helped locate several other breeding females in the Everglades in recent months, the team said. Let the hunters at them, problem solved. so, wadda ya think? filets or steaks? 'I don't like spiders and snakes And that ain't what it takes to love me You fool, you fool Spiders and Snakes by Jim Stafford & where's the Flying circus?